Providing palliative care to Medicaid beneficiaries, who often have complex needs, requires that providers and their payer partners revisit and possibly modify multiple aspects of program design. Everything from payment and care delivery models, methods and frequency of care encounters, and even expectations about outcomes all might be different for a Medicaid population. Understanding how the needs of the Medicaid population are distinct, and developing policy and care delivery strategies that address those needs, is critical to ensuring that all individuals have access to the right care, in the right setting, at the right time. In California, providers, payers, and policy leaders have adopted strategies for doing just that. Historically, Medicaid—known as Medi-Cal in California—has been available predominantly to low-income children, disabled adults, and caregivers of chronically ill Americans. Since the implementation of the Affordable Care Act, 33 states have also expanded Medicaid coverage to low-income adults. In California, a state that expanded Medicaid, 12 million people are now insured with Medi-Cal, many of whom are low-income adults. 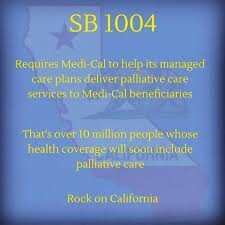 SB 1004, the California law that requires the state’s 22 Medi-Cal managed care plans (MCPs) to offer palliative care to qualifying beneficiaries, was implemented in January 2018. Palliative care services are available to MCP members with specific advanced illnesses (cancer, CHF, COPD, end stage liver disease) who are open to participating in advance care planning and to a trial of home-based care. The law specifies that eligible individuals can receive palliative care concurrently with all other appropriate medical care. Members who qualify for the SB 1004 palliative care benefit are eligible to receive seven core palliative care services, including advance care planning support; palliative care assessment and consultation; a comprehensive plan of care; access to an interdisciplinary palliative care team; care coordination; pain and symptom management; and mental health and medical social services. Spiritual care and 24/7 access to symptom management support are recommended but not required. As a result of this bill all qualifying Medi-Cal beneficiaries in all of the state’s 58 counties now have access to palliative care. Delivery System Reform Incentive Program (DSRIP): statewide initiatives aimed at transforming safety net health systems from fee-for-service to value-based care models. In California, the second iteration of the DSRIP program, Public Hospital Redesign and Incentives in Medi-Cal (PRIME), has initiatives targeting care coordination and readmissions, as well as an optional initiative related to palliative care and advance care planning. Health Homes: a program launched by the Affordable Care Act, which aims to coordinate care (medical and mental health care, social services) for Medicaid patients with multiple chronic conditions who are at high risk for needing acute care services. In California, palliative care is explicitly identified as one of the services that need to be included for patients enrolled in a Health Home program. Read more about how states can expand access to palliative care. Following are three examples of organizations using innovative strategies to provide high-quality palliative care to California’s Medi-Cal patients. 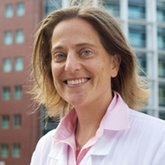 The leaders of the Supportive and Palliative Care Program at Zuckerberg San Francisco General Hospital and Trauma Center (ZSFG) took particular notice of the needs of cancer patients cared for in their safety net system, 25% of whom receive their diagnosis during an acute hospitalization. These patients often are discharged with incomplete prognosis information, and many have uncontrolled symptoms. Such patients are particularly vulnerable in the transitional period between hospital discharge and their initial oncology appointments, and may be lost to follow-up, or may have to return for emergency services when their limited supply of discharge medications runs out. Furthermore, program leaders found that a large minority of these patients (25%) die within three months of their initial diagnosis. In response, the ZSFG team introduced Oncology-Plus, a cross-setting care model that delivers expert consultation in symptom management and advance care planning, as well as educational support to primary and specialty oncology care providers. 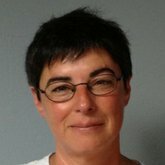 Because a large number of patients receive their cancer diagnosis in the hospital, and because the majority of patients who die of cancer at ZSFG (76%) are hospitalized in the last six months of life, the same providers see patients across hospital and clinic settings, from the time of diagnosis through the end of life. Between hospitalizations and clinic visits, the Plus Team provides remote support to patients through telephone follow up. The program has been well received by patients and referring providers, and has allowed the palliative care team to establish relationships quickly with patients who present very late in their disease course. Take-home: Cross-setting services with rapid response availability can be really important for patients that present late in the disease course. The palliative care program leaders at LAC+USC Medical Center, a safety-net medical center in Los Angeles, saw that individuals with end stage liver disease (ESLD) had significant unmet palliative care needs, including low rates of advance care planning and a lack of understanding of their prognosis. Nonetheless, the system had few resources to invest in new programs, and very little clinic space to devote to a specialty service. The palliative care team made the most of what was available. They secured grant funding to hire a full-time social worker, and otherwise used existing nurse practitioners, physicians, clinic space, ancillary staff, and scheduling platforms. The NP partnered with the social worker, running a half-day palliative care clinic embedded in the Liver Clinic. In addition, the social worker was able to run one (two-hour) group visit per week, offering education, advance care planning, resource connections, and peer support. The rest of the week, the social worker provided phone-based case management and home visits, functioning as the coordinator between services and attending to the mostly psychosocial barriers that so often cause these patients to fall through the cracks in the system. The patients enrolled in case management universally expressed their appreciation for the navigation and advocacy the clinic provided, and for the group visits. The program was also able to show improvement in patient symptoms, and impressive reductions in a range of utilization outcomes, including hospital days, ICU days, and ED visits. Take-home: With thoughtful program design and partnership, adding even a small amount of personnel bandwidth can make a big difference. ResolutionCare is a specialty palliative care provider currently offering services in nine rural California counties. The organization staffs inpatient consultation services and outpatient clinics and provides home-based palliative care using a mix of in-person and telehealth encounters. As a rural provider with a disproportionately large Medi-Cal population, ResolutionCare recognized quickly that the care delivery standards their payer partners were accustomed to might not work well for their Medi-Cal patients. For example, one payer partner had an expectation that patients enrolled in a palliative care service receive at least two in-home visits from a nurse every month as a condition of payment. While the payer had success with this model in other populations, the ResolutionCare team found that some Medi-Cal patients were not available for visits at regular intervals. However, when these “intermittently lost” patients resurfaced, some needed more than two RN visits a month, at least for a time, and others had no need for RN services, but did need weekly social worker visits to iron out issues related to housing, finances, and behavioral health treatment. By tracking the needs of such patients and the possible/preferred methods of meeting those needs, the ResolutionCare team has been able to better negotiate with payers on contract terms they can meet, including incorporating supports (like extra social worker effort) that are needed to achieve optimal outcomes in this complex population. Take-home: Track patient needs and the resources needed to address them, and use those data to inform contract negotiations. Access the California Health Care Foundation’s SB 1004 Technical Assistance Series to help Medi-Cal plans provide access to palliative care. Download CAPC’s Improving the Care of Serious Illness Though Innovative Payer-Provider Partnerships- A Palliative Care Toolkit and Resource Guide, which is part of the Population Management and Palliative Care toolkit. This resource is designed to help organizations working to improve health care delivery by offering best practices in financing and access, and providing action plans to get started.